I know some people hate the dreaded damp “m” word… and if that’s you just skip to the next paragraph because I gotta say it, and I gotta say it loud and proud. These Vegan Banana Nut Muffins are so super MOIST. And I mean that in all the best ways possible. Bursting with banana flavour, little pops of nut crunch, tender, lightly sweet, and gorgeously moist. Mm mmmmm! *”M” word haters may now proceed without fear. I love these muffins because they keep gorgeously fresh for days (not that they last that long). It makes whipping out the door in a rush easy peasy. (Not that I ever whip out the door in a rush)… Ok, so it also makes rolling out of bed, slumping my way to the kitchen, and snacking while waiting for the coffee machine to heat up easy peasy. Double the banana! 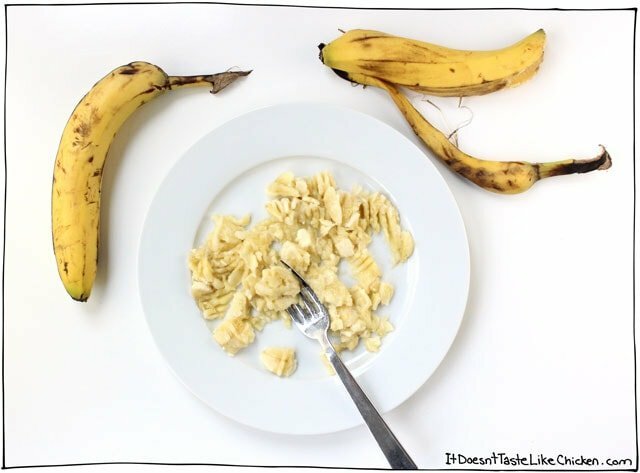 Not only do I mash banana and mix it into the batter, but then I cut up a third banana and chop that into pieces so there are extra pops of banana throughout. Double the nuts! Chopped nuts are swirled through the batter, and once the muffins are scooped into a pan, I additionally sprinkle extra nuts on top. Not only is this pretty, but it ensures every bite gets a gorgeous nut crunch. 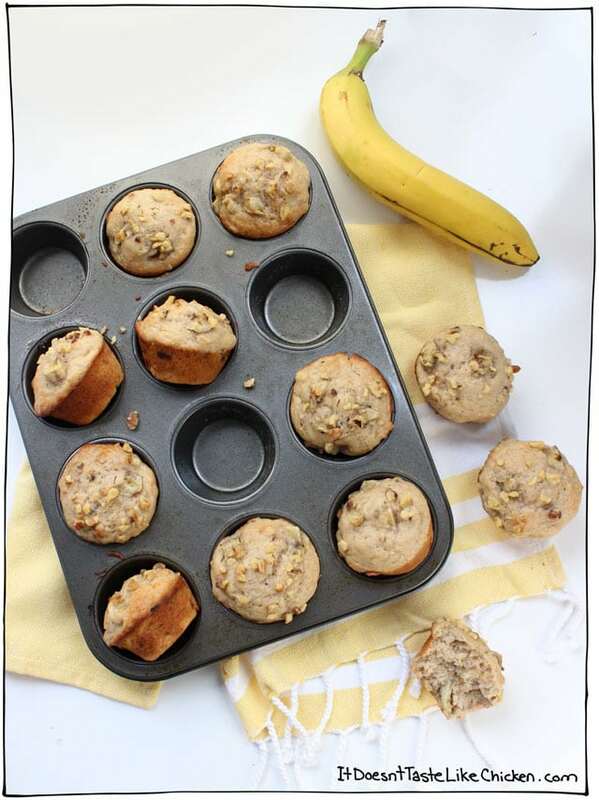 To make Vegan Banana Nut Muffins: mix together all of the dry ingredients together in a large bowl. Mash up two bananas, and cut the third one up into chunks. 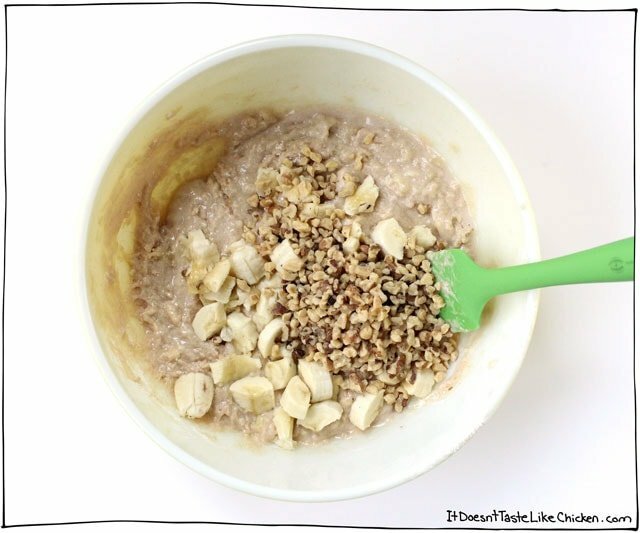 Add the two mashed bananas with and all of the wet ingredients to a medium bowl and mix to combine. Add the wet into dry, and mix until it’s just starting to come together. Be careful not to over mix, lumps are totally cool. Add in the chopped banana and nuts and give it 3 to 4 more stirs. 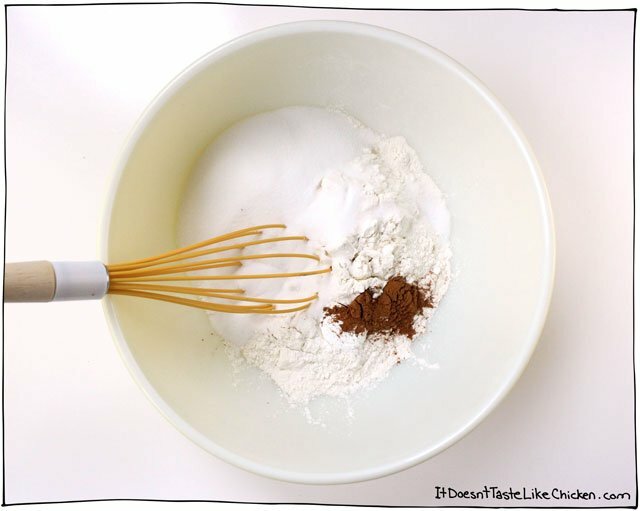 *You don’t want to overmix the batter because then it might not rise properly. Divide the batter evenly among the muffin pan and finish by sprinkling extra nuts on top (optional). Bake for 22 to 26 minutes until the muffins have risen and are golden brown on the edges, and a toothpick inserted into the center of a muffin comes out clean. Let cool for at least 10 minutes before enjoying. Bursting with banana flavour, little pops of nut crunch, tender, lightly sweet, and gorgeously moist. Preheat your oven to 400F (200C). Lightly grease the cups of a muffin pan or fill with 12 non-stick liners. 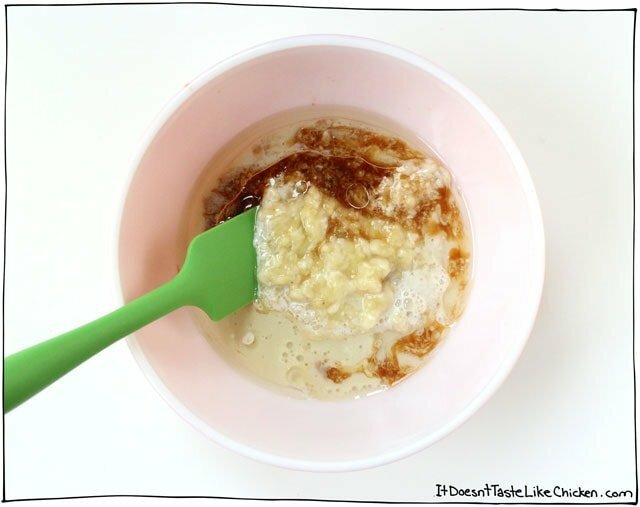 In a medium bowl, mix together mashed banana with all of the wet ingredients. Add the wet into dry, and mix until it's just starting to come together. Be careful not to over mix, lumps are totally cool. Add in the chopped banana and nuts and give it 3 to 4 more stirs. 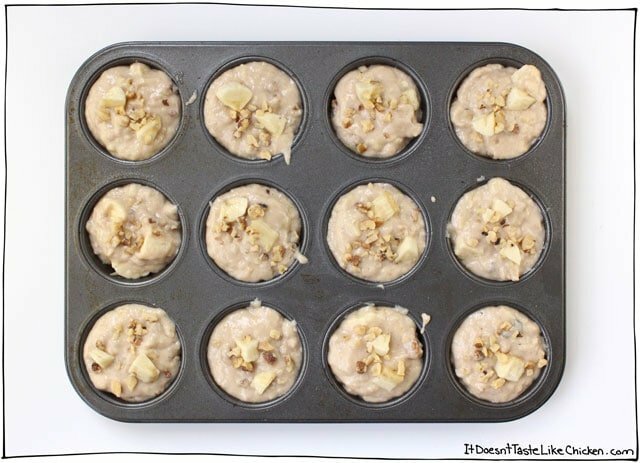 Divide the batter evenly among the muffin pan and finish by sprinkling extra nuts on top (optional). Bake for 22 to 26 minutes until the muffins have risen and are golden brown on the edges, and a toothpick inserted into the center of a muffin comes out clean. Let cool for at least 10 minutes before enjoying. Yes absolutely, The same amount would work great. Enjoy! Just made these and doubled the amount for a school function. Only change I made was I left out the nuts because of allergies. These muffins were wonderful. Next time I will lessen the time by 8 min when using a dark pan. Thank you so much for sharing this recipe. So much yum! These are the best banana muffins I have made! Thank you, Sam! So happy I found your blog Sam! I’d really love to try this recipe!I don’t know if it’s my computer or not, but I’m not seeing the recipe anywhere? Am I missing something? I’m not sure why you’re having problems, Jessica. The recipe is right below the last picture of the muffins and right above the nutrition label. Hope that helps! 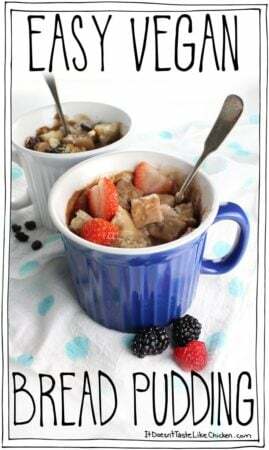 Per usual with your recipes – amazing! 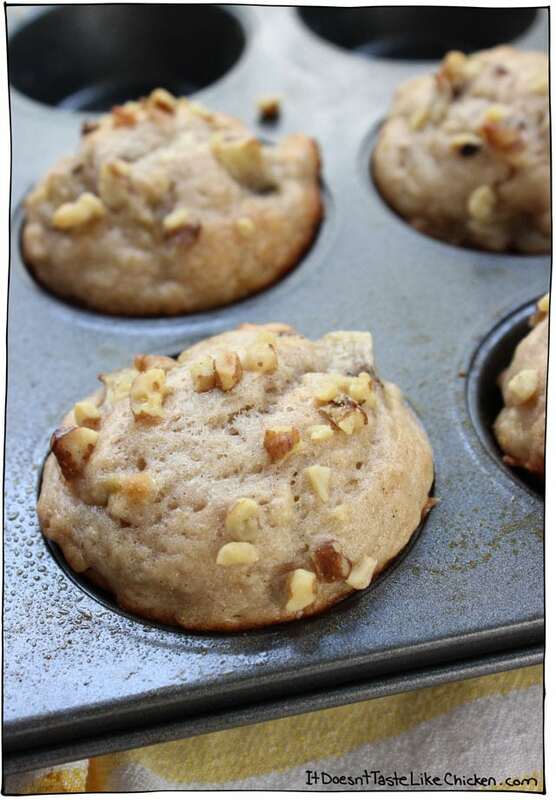 These definitely are the best banana nut muffins I’ve ever had! 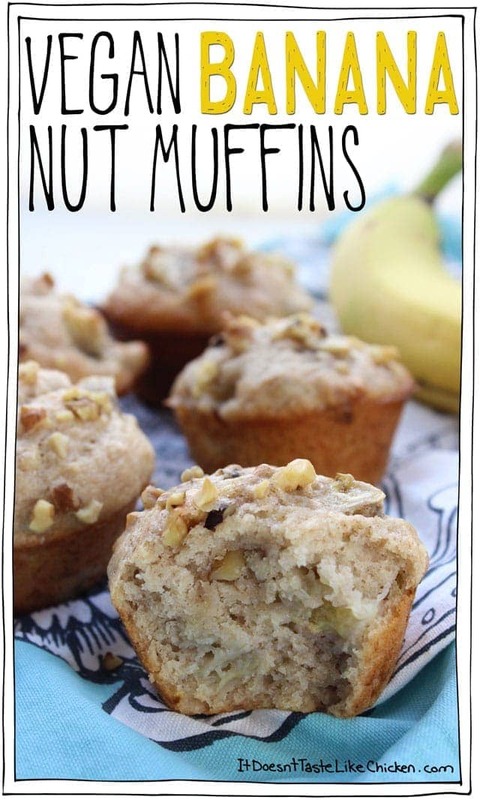 Such a good idea to add in the non mashed banana – never tried that before but it really made them over the top. I think next time I’ll add in some chocolate chips to half the batter for fun. Love these! Thanks for sharing the recipe!!! 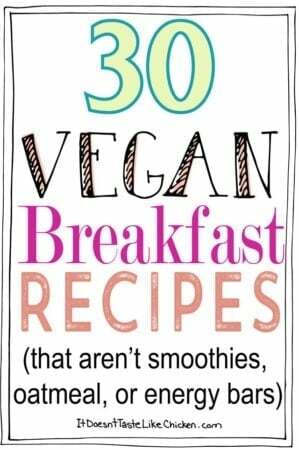 This recipe sounds so delicious, before making them I’m thinking of maybe adding some oats. 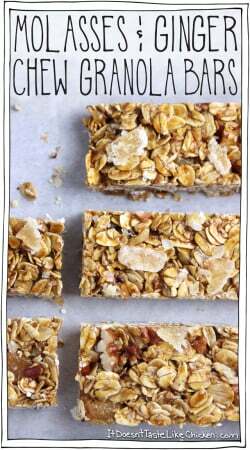 Do you know if I would need to cut down or omit any other ingredients if I decided to add oats? Oats might such up more moisture so you may need to adjust for that. Enjoy! Can you substitute apple sauce for the oil? I’ve heard you can do this, do you recommend this? Thanks Sam. Hi Tim, I have not tried it myself with this recipe so I can’t guarantee results, but I do have some oil-free fans who often do substitutes like that. Made these tonight and they turned out fantastic!! I didn’t add the extra banana or nuts, instead I added Enjoy Life mini chocolate chips! Super easy and tasty! Thanks for such a great recipe! Thank you for the recipe! My niece loved these! I followed your tips with the banana and the nuts. I also replaced 30% of the flour with soy flour for a little extra protein! They turned out amazing! So amazing. So delicious. I’ll continue making these all the time! Has anyone tried substituting sugar for honey? How much honey did you use? So happy you enjoyed them, Crystal 🙂 Honey isn’t vegan so I wouldn’t recommend that, but either way replacing white sugar for a liquid sweetener is a bit tricky and requires adjustment of a few things. Here is an article on how to use agave (which is vegan), and you might find helpful. Enjoy! Made these today in less than 30 min! Super easy, no mess, guilt-free, and most importantly, SO DELICIOUS. Within an hour they were all gone! Definitely going to make them again and check out some more yummy recipes! Thank you! I’ve made these twice now and I love them! 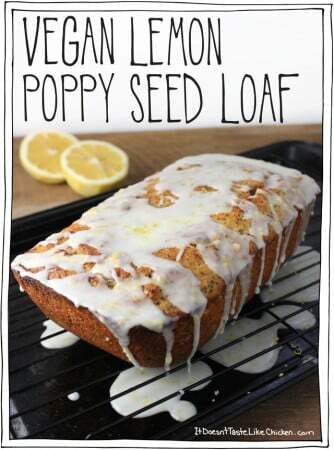 Just wondering if anyone has tried turning them into banana bread instead of muffins? Would I just leave it in the oven longer? Thanks for the recipe! Looks fabulous. What is the weight I need grams of 1 1/2 cups of flour and 3/4 cups of sugar. Also do you know peeled or unpeeled weight of 2 bananas. Thanks. Thanks, Nina! I’m afraid I don’t weigh my ingredients as that isn’t the standard here in Canada. We use volume measurements (cups and spoons). I know some of my followers from the UK have purchased a cup and spoon set online to make cooking Canadian and US recipes a breeze. Hope that helps! Curious about that last question on using a gluten free flour blend, like King Arthur all purpose gf flour blend? It’s what I have on hand…. anyone try this? I had given up on making banana muffins. Thank goodness your blog came to my rescue. I added walnuts and chocolate chips and the muffins didn’t lose any moisture. And no weird ingredients to hunt down. I love these muffins! I make them for my vegan teen and they freeze well! Just take one out of the freezer and pop it in her lunch. 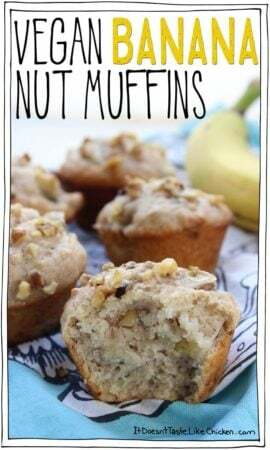 These are hearty muffins and are great for breakfast and snacks. Looking forward to trying more of your recipes! I made these last night and they are all gone lol!! These were soooo good! 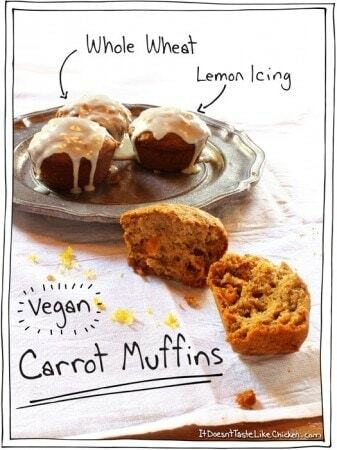 If I wanted to make pumpkin muffins, could I follow this recipe you think? Like substitute the banana for pumpkin? Thanks so much again for another great recipe! So happy you loved them!!! If you substitute pumpkin for banana one to one it should work ok, however, banana is very sweet and pumpkin is not, so you might need to increase the sugar a bit. Hope that helps! 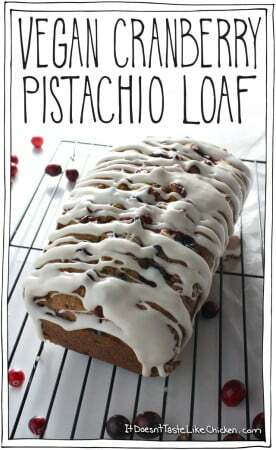 I need to make this without non-dairy milk- nut sensitivities. Can it be substituted for plain water? or apple sauce? Hi kate! Yes, the turbinado is likely the problem as it holds more moisture than white sugar. So sorry they didn’t work out for you! So I made these and added… wait for it… a 4th (3 frozen with all the juices and a more ripe one chunked up) banana and I had an abundance of batter as I made 2 batches. I was wondering if you have tried freezing them and pulling them out for breakfasts since they don’t last long fresh?? Hahaha! Banana overload. Love it! I haven’t tried freezing them myself, but I find in general muffins freeze very well. I would just pop them in a sealable freezer bag when they are still a tad warm (so that they have optimal moisture), and freeze solid. Put on a plate on the counter to thaw. Enjoy! Could chocolate be added to this recipe take it from breakfast to dessert? Our little one is allergic to all nuts, but I thought the addition of some vegan chocolate chunks might be a nice replacement? I was thinking of replacing it in equal parts to the nuts, but I wanted to get your thoughts. Thank you in advance! I should note that I always come to your blog for vegan recipes. No matter what, I know I can rely on your recipes being relatively easy, no surprise ingredients , and always delicious! Absolutely! Substitute the nuts for vegan chocolate chips or chunks in equal parts (or less chocolate if you prefer) and you are good to go. So very happy you always enjoy my recipes. Love hearing that 🙂 Enjoy! They were! I told everyone they could have one. My husband, who thinks banana bread is one of the greatest things (and thinks he doesn’t like nuts in it) said it is *better* than Bob Evans banana bread! And one of my kids asked if there’s a way to ripen bananas faster so I can make it more often. They’re delicious! What a difference the chopped banana makes. The texture is perfect, love the extra nuts on top. Definitely the “M” word. Kristi you actually can ripen bananas in the oven! Hi Sam i just made these muffins and absolutely loved them. Thank you so much. Hey Sam… going to make these this week (sans nuts… not my thing). Do you think 2 frozen bananas would work? I’d still use a fresh one for the chunky banana bits, but I have a few frozen ones I’d like to use. Thoughts? Thanks!!! Yes, the should work, just thaw them first. Enjoy! My daughter and I made these today and they are AMAZING! (Sam, I really need new adjectives to describe your recipes.) So, I used 2 frozen bananas (thawed, including all the watery banana juice), and cut up a fresh banana for the third. Also, yes, I skipped the nuts, but included chocolate chips instead – I think I ramped up this recipe just a tiny notch (I’m biased, since I don’t really like walnuts in my baked goods), but what do I know, I don’t have a cookbook coming out. hehehe Anyway, this recipe is easy, and super tasty, and KID APPROVED! Yay! Bahaha, you’re repetitive adjectives make me feel fantastic every time! So happy you and your fam loved them so much, and chocolate chips are always a good idea! Wow these look incredible! I’m a fan of the ‘m’ word when it comes to recipes, hehe, so these muffins are definitely my kinda muffins! Haha! Love it. I hope you enjoy the muffins, Gemma! I’m an oddity, I do realize, but I dislike nuts in my soft baked goods. Great alone or in most other dishes, but I find them annoying and disruptive while trying to enjoy a delicious, moist(I’m cool with that word.. Ha), muffin, or cookie. That said, I’ve been wanting a better recipe for banana muffins for soooo long! I cannot wait to try these. Have you any suggestions for substituting the nuts with something softer, yet healthy? I usually do berries or something like that, but can sometimes make my baked treat a bit gooey. I’d love any thoughts you have for that. Thank you for all of your amazing recipes! 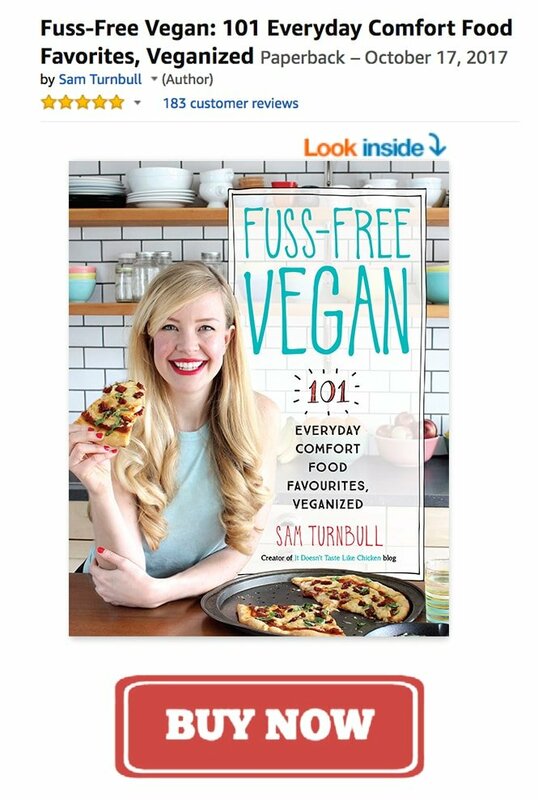 You’ve made it so much easier for me to cook vegan food for myself. The recipe sounds and looks wonderful, however, as a diabetic I just can’t eat 17.1g of sugar per serving. Any chance you can lighten the recipe – please? Thanks so much! Low sugar baking isn’t really my speciality, but this article might be of use. Hope that helps! I may or may not have shamelessly licked the bowl after these went into the oven…. Wonderful! So happy you enjoyed them!